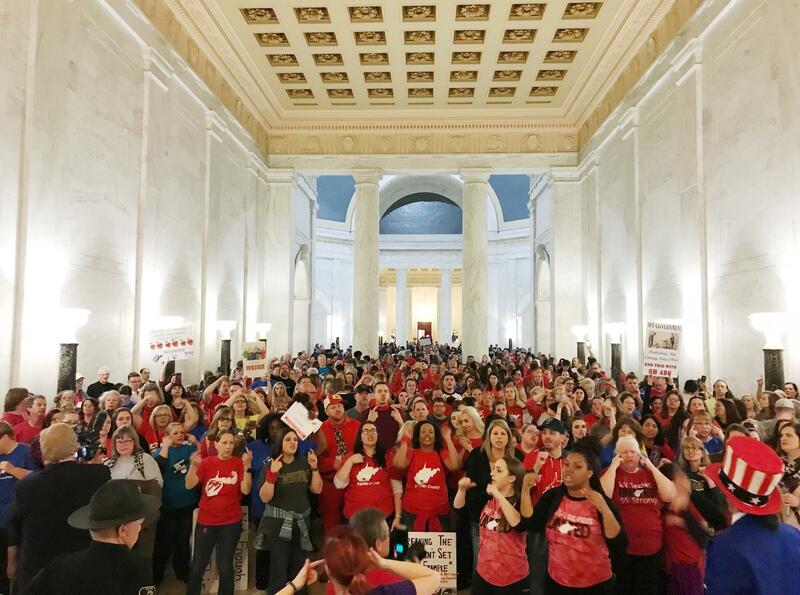 UPDATED: Tue., March 6, 2018, 12:13 p.m.
CHARLESTON, W.Va. – West Virginia’s striking teachers cheered and applauded Tuesday as lawmakers acted to end a nine-day classroom walkout, agreeing to grant them 5 percent pay hikes that are also being extended to all state workers. A huge crowd of teachers packing the Capitol chanted jubilantly, sang John Denver’s “Take Me Home, Country Roads” and some even wept for joy at the settlement. It came on the ninth day of a crippling strike that idled hundreds of thousands of students, forced parents to scramble for child care and cast a spotlight on government dysfunction in one of the poorest states in the country. “We love our kids!” teachers chanted, hugging one another and cheering. Teachers walked off the job Feb. 22, balking at a bill signed by Gov. Jim Justice to raise their pay 2 percent in the first year as they also complained about rising health insurance costs. Justice responded last week with an offer to raise teacher pay 5 percent, gaining swift House approval though the Senate countered with 4 percent – a number rejected by the teacher unions, extending their walkout. “I believe in you and I love our kids,” Justice told teachers after Tuesday’s agreement on 5 percent was announced. He planned a news conference later Tuesday. Several county school systems announced they would be reopening Wednesday. It wasn’t immediately clear whether all 55 county school systems would reopen. A state Department of Education spokeswoman didn’t return an email message. State teachers haven’t had a salary increase in four years. “The winners in this are the students of West Virginia and the educators across West Virginia who finally see a true investment in education,” West Virginia Education Association President Dale Lee said. Senate Majority Leader Ryan Ferns, R-Ohio, said talks with the governor’s office lasted into early Tuesday identifying cuts everyone could agree to. Justice said additional budget cuts by his staff will fund the raises. Blair said if the governor’s estimates of increased revenue estimates from Justice come to fruition, supplemental appropriations could take place. A show of support by thousands of teachers and supporters on Monday didn’t sway lawmakers in time to avoid a ninth day of canceled classes for the school system’s 277,000 students and 35,000 employees. The Capitol was briefly closed Monday after 5,000 people entered the building, posing security concerns. It was reopened an hour later, and teachers vented their frustration over the lack of progress. Published: March 6, 2018, 11:33 a.m. Updated: March 6, 2018, 12:13 p.m.